Forthcoming visits include Belgian freelance journalist Erik Brusten who has been commissioned by Pasar Magazine to write a travel feature about the Island. Pasar has a readership of 126,00 and is regarded as a leading travel magazine for Belgium. Erik and his wife, plus a photographer from Pasar will be on the Island from 28th September to Thursday 2nd October will be visiting some of the Island’s major towns and attractions and will be doing two accompanied walks including Afton Down, the site of the Isle of Wight Festival in 1970. Helen Werrin, travel editor of Motorcaravan Motorhome Monthly plans to visit at the end of October to write a 6-page feature in MMM for next May or June. Helen was looking for a destination with lots to do year-round that has broad appeal for her variety of clients, including MMM, Mature Times and the NFOP (National Federation of Occupational Pensioners). Helen said it’s nearly 30 years since her one and only visit to the Island so she’s looking forward to discovering the potential here for a fresh and lively article. Recent coverage generated by the Press Team has included a glossy 4-page feature in Italy’s ‘Gioia’ magazine, which has a readership of 600,000. Maria Broletti Dal Lago and Giovanni Tagini travelled to the Island in June and visited many attractions which have since been featured in their article. These include The Little Gloster, Osborne House, The Royal Hotel, The George Hotel, Dimbola Lodge and Priory Bay Hotel. Please click here to view the feature in this magazine. 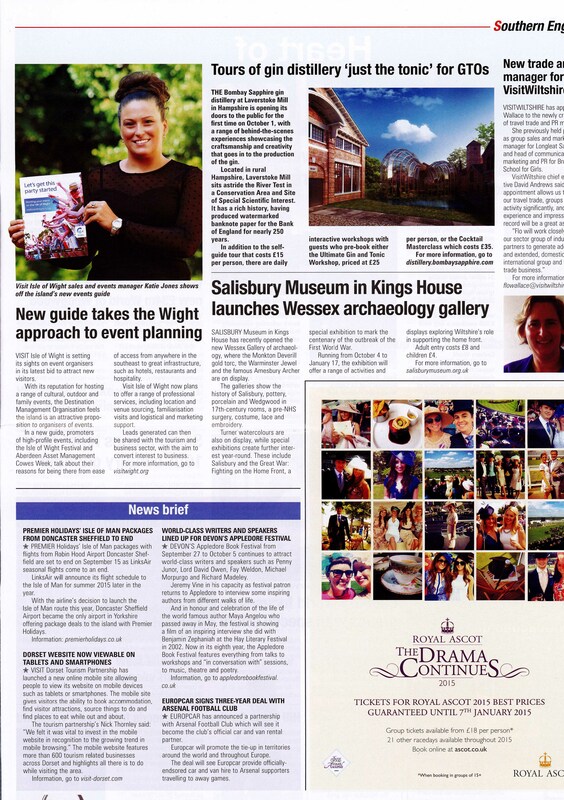 Katie Jones, Visit Isle of Wight’s Sales and Events Manager, has also been featured in this month’s Travel GBI magazine which goes out to the tourism industry and has a circulation of over 12,000. This story was picked up following a press release by VIOW’s Press Officer, Sue Emmerson,regarding Katie’s new events publication which was created to generate interest in the Island as an events venue. Please click here to view the feature in this magazine. The press are hot on our heels looking for any new themes, big news or feature ideas? While we have a range of ideas and stories we are passing on, we are looking for anything new, newsy for 2015. If you have or know of anything happening in 2015, please forward the details to sue@visitwight.org.